TBS will exclusively televise Game 4 of the National League Division Series (NLDS) presented by T-Mobile - Washington Nationals vs. Chicago Cubs - tomorrow, Tuesday, October 10, at 5:30 p.m. ET. The Cubs currently lead the best-of-five series, two games to one. If necessary, tomorrow's Game 4 between the Arizona Diamondbacks and Los Angeles Dodgers will begin at 9 p.m. on the network. Game coverage will be preceded by the MLB Postseason Pre-Game Show on TBS at 4:30 p.m., featuring Hall of Famer Pedro Martinez, nine-time All-Star Gary Sheffield and former NL MVP Jimmy Rollins joining host Casey Stern. The studio team will also offer postgame analysis on The MLB Postseason Show on TBS presented by the Lincoln Motor Company. The network's upcoming postseason schedule and production notes follow. • TBS will exclusively televise the National League Championship Series (NLCS) presented by Camping World, beginning Saturday, Oct. 14, with Game 1 of the best-of-seven series. • The NLCS will be called by Anderson and Darling, with Ryan. • For the first time, TBS's NLCS coverage will bring fans even closer to the sounds of the game through the use of microphones embedded into the grass on the playing field. Four RF microphones will be located in front of home plate, one each in front of, and behind, the pitcher's mound and one each in the grass behind the second baseman and shortstop. • MLB on TBS studio features throughout the postseason will include interviews with some of the National League's biggest stars, including a conversation between two of the game's all-time great pitchers, Kershaw and Martinez, a look into the day in the life of a manager with the NL East Champion Washington Nationals' Dusty Baker, and Goldschmidt and Arenado chatting with Darling about their exciting young teams. 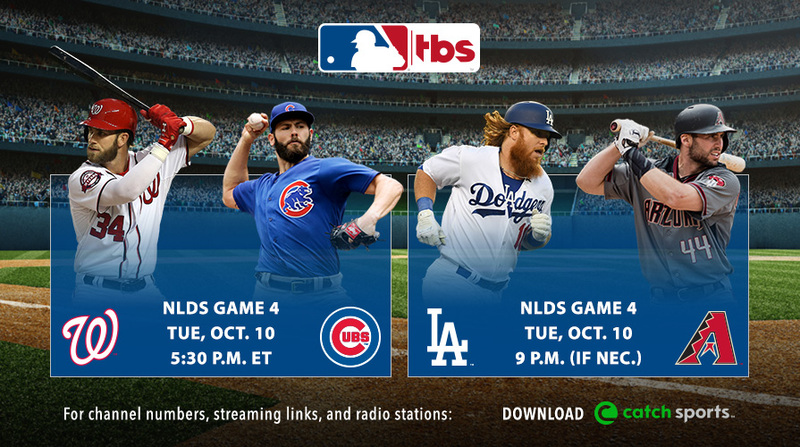 • Live streaming coverage of all MLB Postseason games airing on TBS will be available via www.tbs.com and the Watch TBS app. • Fans will be able to access the games whenever and wherever they desire by logging in with the user name and password provided by their TV service provider. • Additionally, all MLB on TBS Postseason game telecasts will be available in Spanish via SAP. • All NL Postseason game telecasts will also be available in Spanish on the CNN en Español channel. • In addition to its exclusive live game telecasts on TBS and live simulcast streaming on TBS.com and the Watch TBS app, Turner Sports and MLB Advanced Media will once again partner to provide fans with digital companion coverage via Postseason.TV. • Postseason.TV delivers baseball fans up to 10 live alternative camera angles and is available for every game televised by TBS during the MLB Postseason including the NL Wild Card game, NLDS and NLCS. • Subscribers can customize their viewing experience by picking up to four different cameras simultaneously during live game action. • Fans can also exclusively watch live coverage of their team’s batting practice before each postseason game. • Postseason.TV is accessible via desktop and mobile through MLB.com's At Bat 17 app for supported iOS and Android smartphones and tablets.